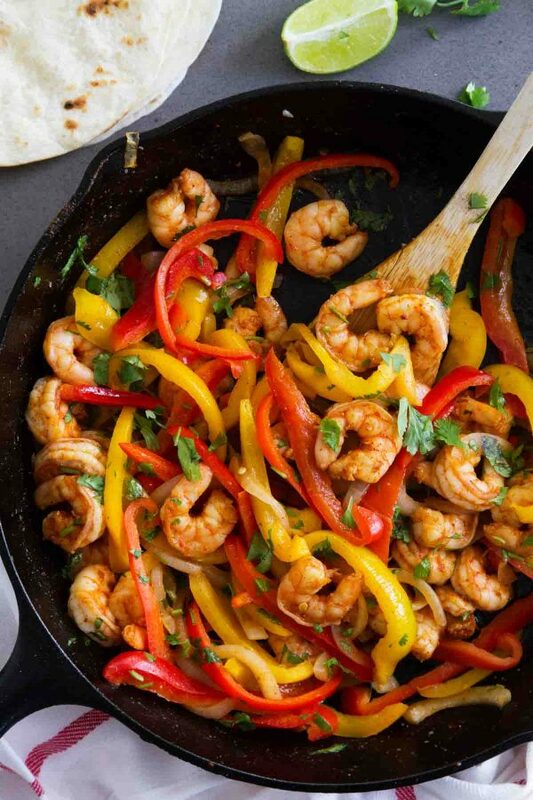 Dinner in a jiffy – these Skillet Shrimp Fajitas are not only good for you, but can be done in under 30 minutes! 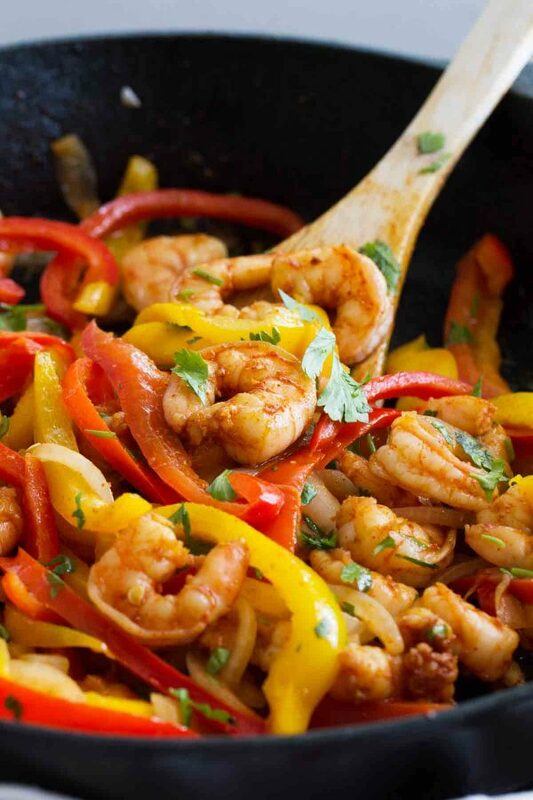 Peppers, onions and fajita spiced shrimp are all cooked in one skillet for an easy dinner. It’s September, which means it’s my birthday month! And while I don’t normally like to talk about my age, this birthday is a pretty major one. I turn the big 4-0. Yikes! 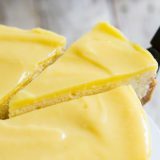 I’m actually just fine with turning 40 (although my husband likes to joke and call me old – he’s a few months younger than me), because most of the time, I don’t feel like I’m 40. Maybe it’s because my kids are younger, or maybe it’s just because when you turn 40, 40 just doesn’t seem as old anymore. I’ve always been a believer in moderation in all things. Serial dieting is not for me – I don’t do fad diets, or totally restrict sugar or carbs or anything from my diet. It just doesn’t work for me. I like food, and if I’m not able to splurge every now and then, it will never work for me in the long run. But now that I’m almost 40, I can definitely feel the changes in my body. So I’ve had to take that moderation in all things and tilt it just slightly to the healthier side. As much as I’d like to just eat anything I want, I just can’t do it anymore. 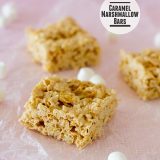 I had gotten into the habit of lunch consisting of the leftovers on my kids’ plates, and the kids and I made way too many trips for sweets this summer. So I’m trying to be more conscious as I head into my 40s. Part of that change is to make smarter decisions when it comes to meals so that I can have that piece of cake or try that new restaurant. And as it turns out, eating smart at home is pretty darn tasty. 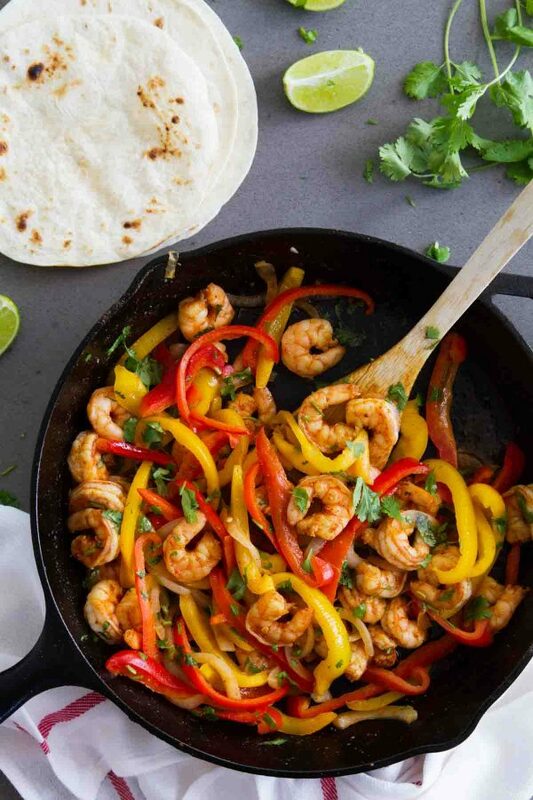 As proved by these Skillet Shrimp Fajitas. Fajitas are a pretty normal thing at our house. And as much as I like chicken, sometimes you just need a break. Not only is shrimp a great way to change it up, but it’s also super easy and fast to cook. I tend to look to shrimp recipes when I’m looking for a fast and easy dinner – like this Chipotle Lime Shrimp Taco Recipe. Or these Spicy Shrimp Bowls. Plus, I think that my kids actually like shrimp better than they like chicken. So it’s a winner! 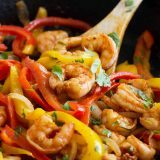 These Skillet Shrimp Fajitas are super fast (dinner should be on the table in 30 minutes), they are packed with flavor, and they are low in calories. I don’t think you could find a better combination. 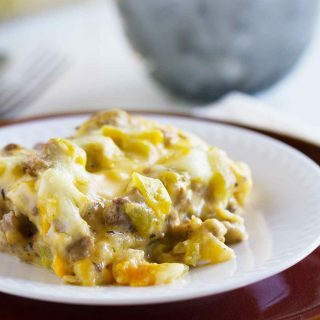 This is a skillet dinner that the whole family will love! In a large bowl, combine the shrimp, chili powder, salt, cumin, garlic powder, and smoked paprika. Stir to combine and let sit for about 15 minutes. Meanwhile, heat 1 tablespoon of the oil in a large skillet over medium-high heat. 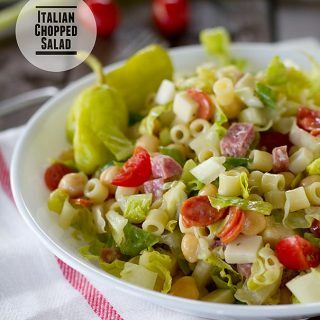 Add the red bell pepper, yellow bell pepper, onion and 1/2 teaspoon of salt. Saute the peppers and onions until they are slightly softened, about 4 minutes. 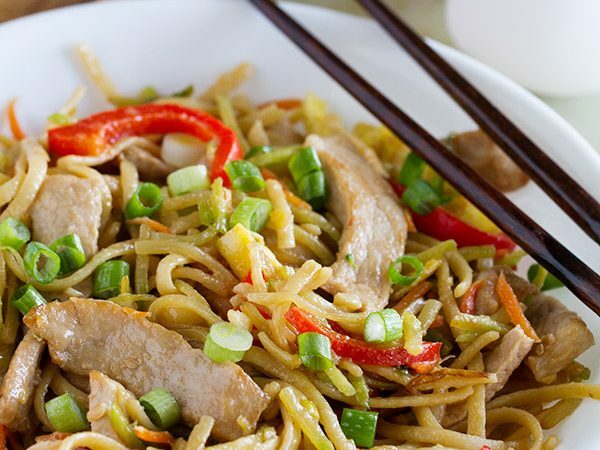 Remove the peppers and onions from the skillet to a plate. Add the remaining 1 tablespoon of oil to the same skillet. Add the shrimp mixture and cook until the shrimp are no longer pink, 4-5 minutes. Squeeze the lime juice over the shrimp. Add the peppers and onions back to the skillet and cook an additional minute to warm through. Sprinkle the fajita mixture with cilantro. 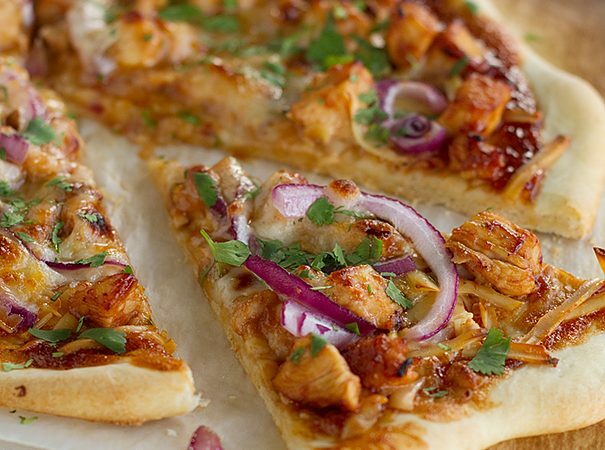 Serve on tortillas with desired fajita toppings. 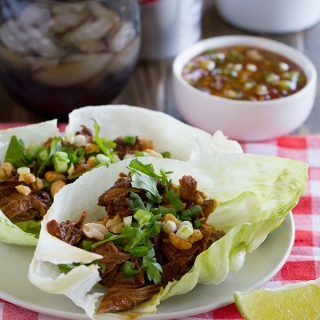 Nutrition facts do not count tortillas or other fajita toppings. Oh yes! 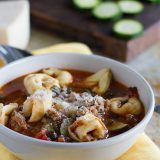 This is thee perfect weeknight dinner. 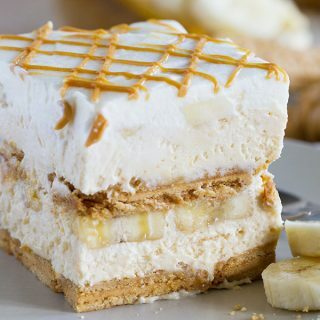 Looks delicious, simple and satisfying.